During the time of the harvest it becomes readily apparent the importance of cold storage space, a location protected from the freezing temperatures as well as the mice and squirrels, where we can safely store the season's abundance through the winter months. Potatoes, winter squash, carrots, parsnips, beets, apples and pears are examples of foods that can keep through much of the winter if stored in a cool, but not freezing, dry place. 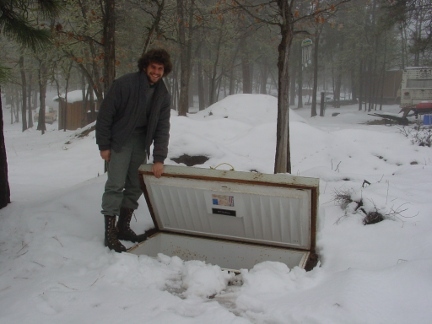 One option we are experimenting with this year is an old freezer chest that we have converted into a root cellar of sorts. Root cellars traditionally are underground‒either beneath a house or in a separate out-building‒taking advantage of the relatively constant but cool temperatures (between 40-45° F in our region) of the ground below the frost line (which here, during the coldest winters, is only an inch or two beneath the surface). 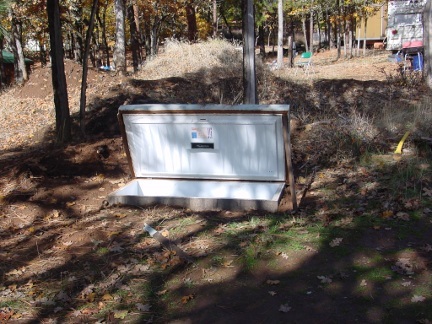 Since chest freezers do have a limited working life, we have accumulated a few over the years and wanted to test the capacity of a freezer buried in the ground as a space that could be used to prevent food items from freezing. 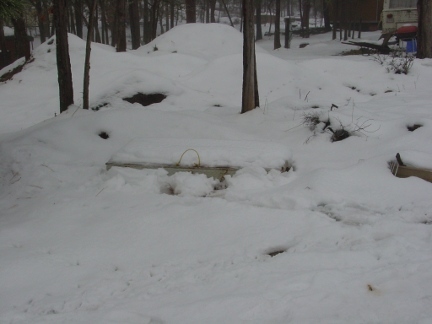 The first step was to dig a hole just large enough to fit the chest freezer. The next step was to remove the motor and cover over the created hole with a sheet of metal. Freezers are already quite moisture proof, but just a little moisture can mean the difference between eating potatoes in February and finding a heap of rotten goup. So we added another protective barrier against moisture by painting tar on the outside. Then we created an additional insulated lid with plywood and foam insulation to protect the top‒which would be at the surface‒from cold temperatures as well. 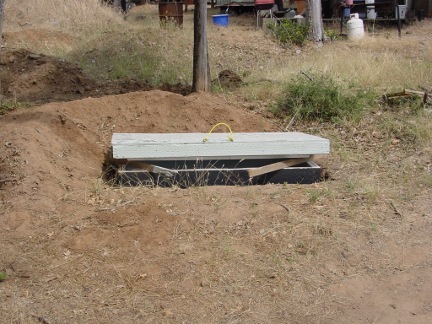 Before placing the freezer in the ground, we added a few inches of gravel, so that the freezer would not be sitting in mud during the wet season. 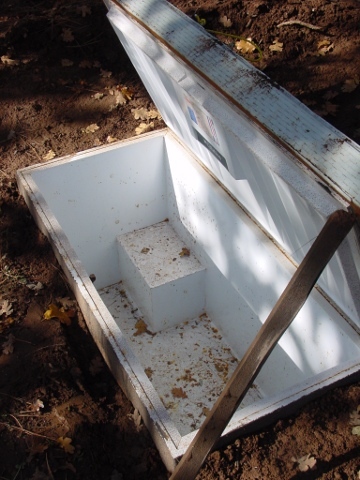 Once the chest was lowered into the ground and any empty spaces were back-filled with soil, the freezer was ready to use for storage. Last weekend I brought home a large quantity of apples from a neighboring orchard. Since our other storage spaces were already rather full, I decided to fill our new root cellar with apples. Rather than just filling the apples directly into the freezer, we filled the apples into metal baskets (also from old freezers) and stacked the baskets. This way each apple has less weight on it, and in theory is less likely to bruise. So far I am quite pleased with the chest-freezer turned root cellar. But the real test will be in the weeks and months to come to see for how long we are still able to enjoy crispy apples. A few weeks ago we were hit with a not too uncommon November cold snap, with night-time temperatures as low as 5°F., and several days in a row where even the daytime highs did not reach above freezing. 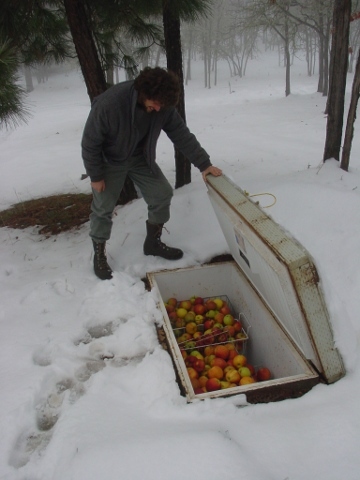 I had placed much of our winter supply of whole apples in the experimental below-ground cold storage‒made from an old chest freezer‒ only a week or so prior to the single digit temperatures. With such a sustained cold, I was concerned that perhaps the cold had seeped into the chest freezer, freezing and thus effectively reducing the desirability of the apples. Apples stored near the door in one of our outbuildings, which we keep at about 40 °F, had indeed frozen, heightening my concern about the rest of the apples in the chest freezer. 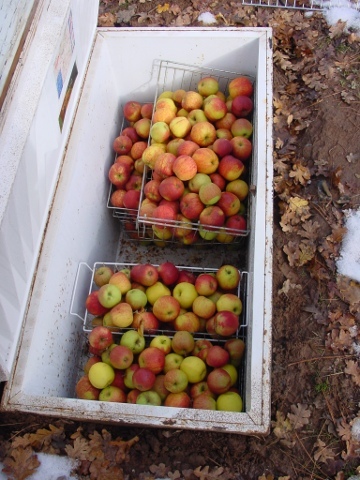 We recently have had some relief from the extreme cold, and today, with temperatures a few degrees above freezing, I decided to check on the apples stored in the below-ground chest freezer. I had to kick some snow off the lid to find the handle, but the lid lifted easily despite the added weight of 8 inches of wet snow. The familiar smell of ripening apples greeted me, transporting me thousands of miles to the east coast and the cold storage facility of the apple orchard where I used to spend much of my time in Rhode Island. Alan, the orchardist, would store his season's crop in a large temperature controlled room, so he could continue to sell apples and make cider through the winter. Whenever I would go in there to find a certain apple variety or help move around the crates before making cider, the smell of ripening apple would overwhelm me. Not surprisingly, a cold storage room of ripening apples smells sweet, but not a sweetness that is reminiscent of the rot or spoilage that can be associated with over-ripened fruit in the heat of July or August. But its the smell of cold and often dampness that, combined with the sweet smell of apples, is surprising and unusual. And this is the smell that wafted out of the below-ground chest freezer when I opened its lid this morning and reached in to asses the state of its precious contents. Thankfully, I saw no signs of frozen, damaged or rotting apples. I did of course taste one, and it was deliciously sweet, the sweetness that comes when the sugars of the apple are concentrated by the cold, and satisfyingly crisp. So, the below-ground chest freezer seems to be doing its job well, keeping the contents cool but not frozen. However, the simple fact that I could smell such sweetness is a reminder that the apples are continuing to ripen, and won't store forever without becoming soft or over-ripening. But then again, I wouldn't want to eat something that couldn't spoil anyway; it's just a matter of prolonging this process as long as possible.